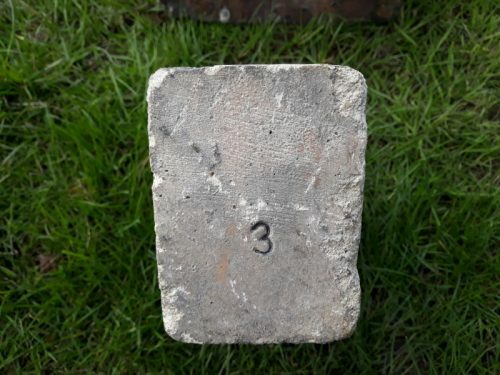 The ‘3’ is stamped on an end of the brick. Hurlford Fireclay Works, Galston Road, Hurlford, Ayrshire. 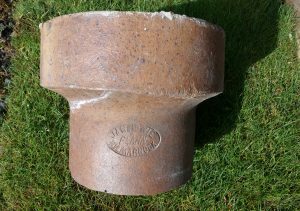 Found by Ian Suddaby at Cruden Bay, Aberdeenshire. J & R Howie Ltd, Hurlford, Kilmarnock. 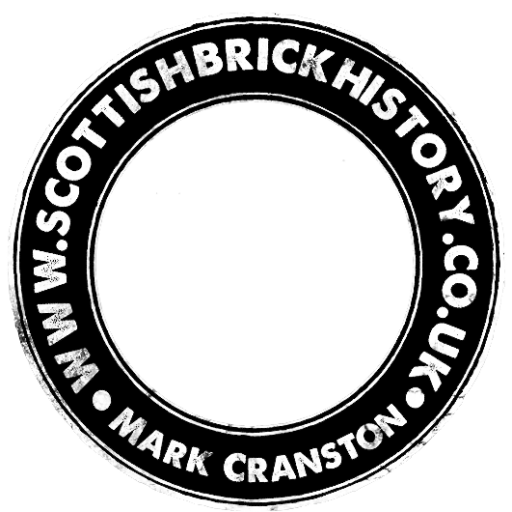 . . . .
Found o Hurlford Fireclay Works, Galston Road, Hurlford, Ayrshire. 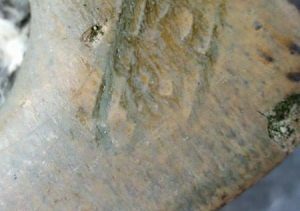 This appears to be Marked Hurlford to one side and Howie, most likely J & R Howie, to the other. 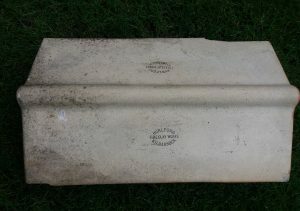 . . . . Below – This whole example was found by Graham Brooks in the Solway area. .
Found Kilmarnock. 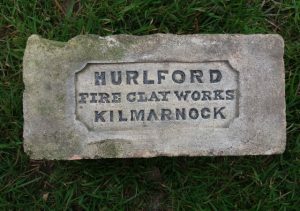 Hurlford Fireclay Works, Hurlford, Kilmarnock, Ayrshire. 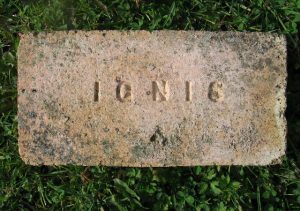 . . . .
Found in a reclamation yard in Blackburn, Aberdeenshire and in the possession of Ian Suddaby. 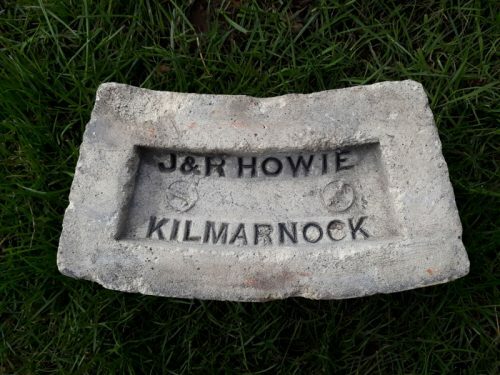 J & R Howie, Hurlford Fireclay Works, Galston Road, Hurlford, Ayrshire. 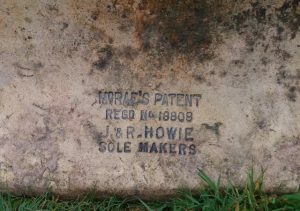 McRae’s Patent Regd No 18808 J & R Howie Ltd sole makers. I am informed that the patent / registration of this item dates from 1884. . . . …. Found in a reclamation yard in Blackburn, Aberdeenshire. 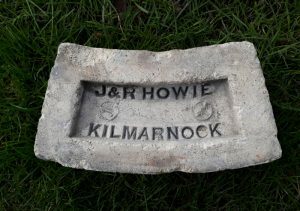 J & R Howie, Hurlford Fireclay Works, Galston Road, Hurlford, Ayrshire Short horn ventilator – ridge tile. . . . . .
Found by Eddie McLean in the Glasgow area. 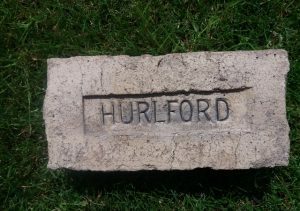 Hurlford Fireclay Works, Hurlford, Kilmarnock, Ayrshire. . . . .
Photographed by Tucker Kennedy at Mull of Galloway. This is not in my possession. 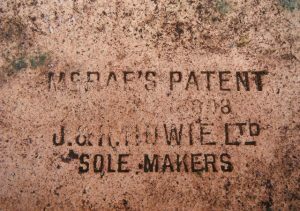 J & R Howie Hurlford Fire Clay Works, Kilmarnock. The monogram depicts J & R H . . .